Decisions are something we are called upon to make each day. It is has been that way from the time we were young to wherever we are at this point. Some of the decisions are tough while others come easily. In the OT Moses had to decide whether he would lead the people out of Egypt. The twelve spies had to decide if the land of promise could be taken. A widow had to decide whether to fix a cake for Elijah. Jeremiah had to decide whether to keep preaching. In the NT Joseph had to decide if he would take Mary as his wife, while Mary had to decide to surrender to God. The 12 disciples had to decide to follow Jesus. A Samaritan woman had to decide to trust a Jew so a well would spring up within her. A woman caught in adultery had to decide if forgiveness offered was enough to give her strength to walk away from a sinful relationship. Paul had to decide to follow Jesus. He said - “To live is Christ, to die is gain.” The Roman soldiers had to decide to follow their orders regardless. Joseph of Arimathea and Nicodemus had to decide to step forward and claim the body of Jesus. But before that Jesus had to decide whether to go through with this crucifixion. He prayed – “Father, if Thou art willing, remove this cup from Me; yet not My will, but Thine be done.” His decision set the standard for all decisions to follow by every Christian. The standard for our decisions is the will of God for our lives. Our decisions come down to whether we will allow the will of God to be fulfilled in our lives or not. Will we say yes when God calls us or will we say that the work is more than we can handle? Every day we are called to make large and small decisions. But the biggest decision we have to make is if we are going to follow Jesus. Joshua said, “….choose for yourselves today whom you will serve; whether the gods which your fathers served which were beyond the River, or the gods of the Amorites in whose land you are living; but as for me and my house, we will serve the Lord.” (Joshua 24:15). He called them to decide which way their heart would lead them. God is calling individuals, families, nations, our world to decide how we will live out the lives He has entrusted to us. What way will our hearts lead us as we step into the days before us? Will we decide that God is not who He says He is? Or will we decide that He is not only worthy to be followed, but worthy to be praised, honored, and adored? There is a decision to be made by every person. Truth is that all of us are standing at the corner of obedience and disobedience. The road we decide on will determine the direction we go. Jesus said that one way is wide and leads to destruction while the other is narrow and leads to life. (Mt. 7:13-14) It seems that destruction is the easier road to travel but after all it’s on a downhill slide. The narrow way may be more difficult but when we make that last bend in the road and see all that is prepared for us, it will surely be worth it all! As you make the decisions you’re called upon to make in this day, consider the call of Christ on your life and let His Spirit lead you. While there is a way that seems right to man, there is a way that is right to God. 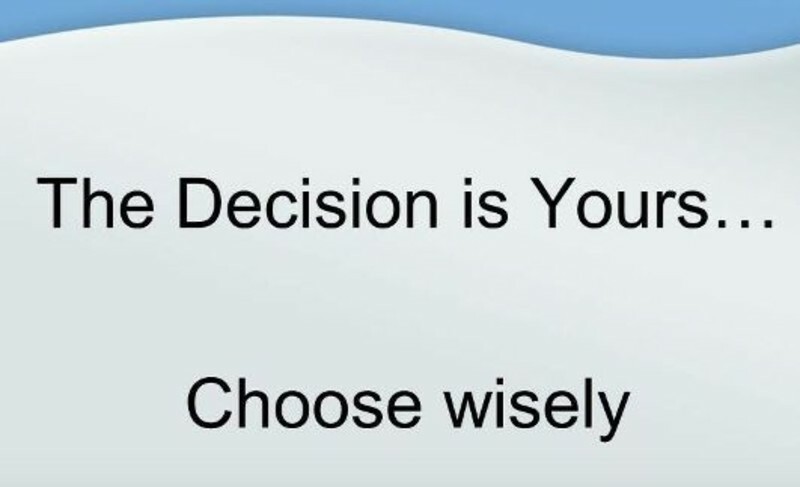 So “…choose for yourselves today whom you will serve…” What’s your decision?